All those years ago when I was a journalist, I attended my fair share of conferences. Dash in, latch on to a story, grab a sound bite, and rush out past the morning tea table slapping a couple of buttery scones on your notebook. Well, it might be the last food you get for the rest of day! It never ever was but that didn’t stop the pattern. So, I approached the two-day food bloggers conference in Wellington on Friday unsure what to expect but with an inkling that the scones would probably be superior than most on this planet. After all, it was being held at the new Le Cordon Bleu Cooking school and they were providing morning and afternoon tea. 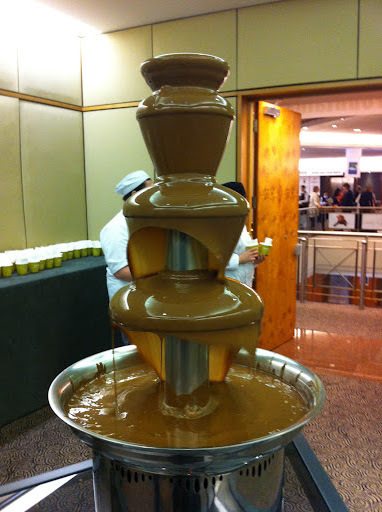 The opening was at the New Zealand Chocolate Festival. I’m now a fan of chocolate before morning tea, as well as after. 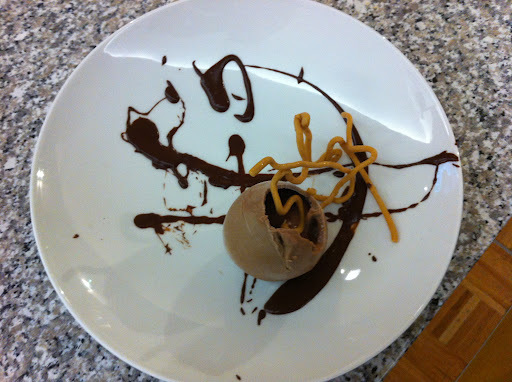 After NZ food blogger association founder and ‘organiser extraordinaire’ Allison Mawer opened the conference we had a demonstration from Chef Juan Balsani from the Kermadec on using a balloon, chocolate and nitrogen to make a spectacular looking dessert with chocolate spaghetti (the caramel squiggle in the photo). That was the start of two days of talking and hearing about food and drink – where to buy it, how to eat it, how to make it,and how to photograph it. 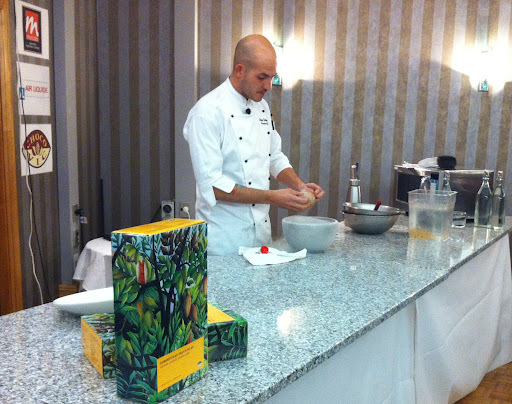 Jared Gulian from Moon Over Martinborough Olive Oil, was delightful. Great story teller who publishes in Wairarapa Lifestyle and has won awards for his blog. Alison Brook from HarperCollins gave us an insight into the food and cookery book world. For all you hopeful writers out there gagging to get published, her advice is authenticity, personality, an engaging writing style AND spectacular food styling and photography. Lucy Corry, food blogger and Dominion Post Life editor talked about the blogging – check out her blog http://kitchen-maid.blogspot.co.nz/. Key message from her – if it’s a blog about food don’t fill it with photos of your bloody cats. Although Jared says he got more hits on his site from photos of a baby lamb than from anything else. Anyway, you’re not likely to find either on this site . Well not until we find our larger piece of paradise in the Wairarapa country side. At which time I will probably blog much too often about sponge cakes made with fresh duck eggs. You should see an improvement in my photographic skills after Viviane Perenyi’s session on food photography but like panteen it wont happen overnight. We capped off the day with Alessandra Zecchini showing us how to make Sugar Flowers. I can’t believe I bought them for Harriet’s 21st cake when they are so easy to make. She’s going to get an amazing cake for her 22nd. That’s day one. Musings on day two will have to wait. I am off to the Patisserie Introduction course at LCB as part of Visa Wellington on a plate. Obsessed? Absolutely. You are having sooo much fun!! Ohh tell us more about the chocolate spaghetti! Lovely blog – I've had the best time looking around. I hope your course is going well. 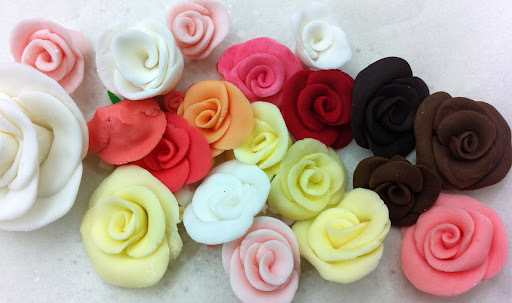 I really enjoyed making the sugar roses too, I think a lot more cupcakes will be decorated this way in the future!